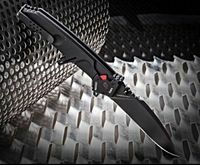 This model is basically a larger version of the MF1 and has all the characteristics of the smaller version plus an additional unique handle. It does include the glass breaker on the end and the bridge clip for a deep pocket, discreet carry. This version has the classic Testudo (black) finish. This is a very durable finish that is very protective against corrosion and oxidation. What sets the MF2 apart from the MF1 is not only its larger size but it has a very distinctive handle. The MF2 has a "sub hilt" giving you an extremely stable, positive grip that prevents your hand from slipping. *** The handle is made of anodized Anticorodal, an aluminum alloy that is very strong and corrosion resistant.